We specialize in findings, gemstone beads and Swarovski crystals. We also carry cabochons and stones for wire wrapping. We carry gemstone beads of good quality in 4,6 and 8mm and different shapes. We carry an extensive selection of pewter and sterling silver findings. We have Swarovski crystals in 4, 6 and 8mm cubes, bicones and rounds with a big selection of focal piece beads. How it all began…A friend recommended the book The Artist’s Way. I read it thinking it was about becoming an artist. Really, it was a writing workshop for future writers. Julia Cameron recommended writing morning pages; three pages of handwritten, single space writing every morning. I have been writing morning pages since 1998. Characters have talked to me, ideas have bubbled up and correspondences have written themselves for me in them. Over the years, I learned that Morning pages release one’s inner critic. That is helpful for anyone doing creative work. The inner critic stops the creative flow and does worse. In The Artist’s Way, she recommended taking one’s self on an artist date on a regular basis. I try to go to fun, colorful or inspiring places every so often. I love the butterfly conservatory in Deerfield, MA as a most inspiring place to go. Artist dates allow one to think more creatively. Artist dates encourage me to play artistically. I did career counseling at a college for over five years. For every person who came to identify what they wanted to do for a career, most avoided taking action. I used career inventories, the MBTI and the Strong Interest Inventory seeking answers. Often, I discovered as much with my own pen and paper inquiry, Occasionally as I struggled with career answers, I got psychic ones. The psychic ones were the most accurate. That is another story. According to John Holland (think astrological signs of career world), we have interests in six areas that we need to express to be happy. Expressing an artistic side is a strong need as a passing interest, a career or a hobby. I began making jewelry seriously after a jewelry making class that my intuition told me to take. I have taken many art classes over the years and love them all. I loved a pottery class I took in 1990 and have been plotting the purchase of a pottery kiln since then. My company name is Potter’s Ink Incorporated for the creativity we all posses which flows when unrestricted by criticism. 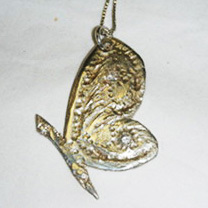 All jewelry makers have an artistic side that they need to express. Going to a beautiful bead shop is a jewelry makers artist date. One goes to enjoy beads, or find something specific. I go to become inspired by some strand. I will buy something and be inspired to sit down now and make some piece of jewelry just for fun. On January 3, 2008, I asked my intuition what I should do to make myself happy in the future. The answer I got was, ‘to open a bead shop.’ I opened a bead shop that I would love to visit. I hope that you will too. P. S. On this path of life, I sought many logical and rational answers. I spent years racking up loans as a graduate student. The psychic and intuitive answers have been the most interesting.